Snapshot analyses measure counts or percentages for a given period, usually the most recently completed year. If any counts or percentages are unexpected, comparison, trend or spatial analyses may be necessary to better understand the reasons for the unexpected results. 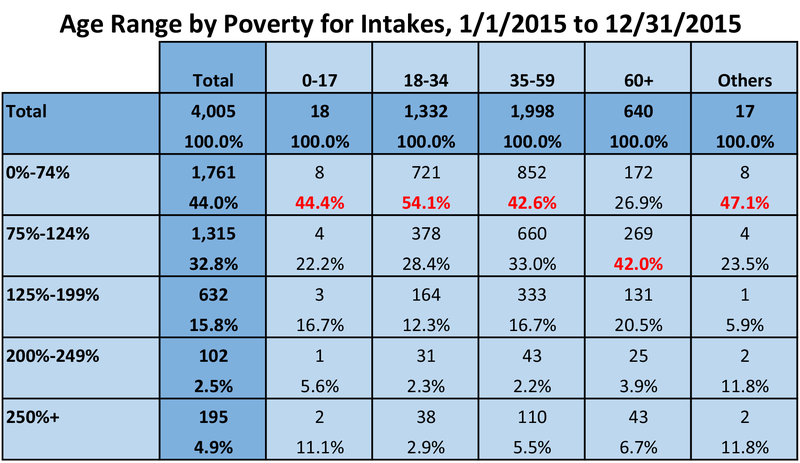 What are the demographic characteristics (example: age ranges and poverty levels) of the people who requested assistance in the last 12 months? Are the percentages by various demographics what you would expect? If not, can you explain the difference? For example, did you expect that the largest share of intakes come from clients with poverty levels under 75%? How do the demographics of people requesting assistance relate to each other? For example, is the poverty level of older potential clients higher or lower than the poverty level of younger potential clients? Other case information that you might be able to use in other analyses, including problem code, other demographics, etc. Collect data about intakes from your CMS for the most recently completed year. Create tables, pivot tables, cross tabs, or charts within Crystal Reports, Excel, or whichever analysis software you prefer that show the count and proportions of cases by each demographic characteristic (Crystal Reports cross tab shown in this example). Create categories, such as age ranges and poverty levels so the analysis is in summary form and easier to review. Use conditional highlighting to draw attention to high percentage, such as red and bold for any percentage 40% or higher. 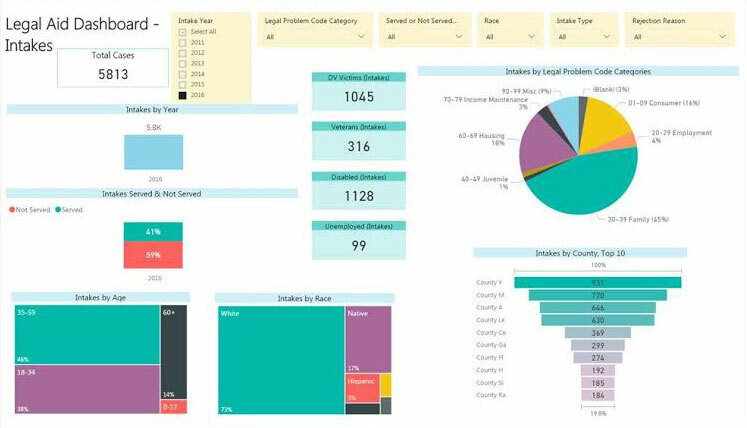 With your case management system data exported to Excel, you can use MPBI to easily create visuals like the ones in the Intakes Dashboard below.